We don’t have tofu at home real often – I usually get my fix ordering it deep-fried in Thai restaurants – but when we do, one of my favorite ways to eat it is with broccoli and peanut sauce. I remember we made a sort-of version of this back in college, when I lived in a vegan interest house on the edge of campus. One day we discovered we had left our shipment of tofu out on the porch…in Minnesota. In January. 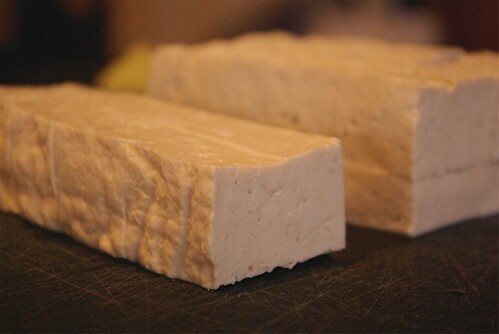 In case you haven’t done this yourself, let me tell you that frozen tofu takes on a really interesting texture, kind of like a hardened sponge. It’s not entirely unpleasant, and actually it was such a nice change from the usual that we all got very enthusiastic about it for a while. Anyway, we would cut it into cubes and toss it up with broccoli and peanut butter and rice, and it was good and more filling than a lot of the things we cooked in that house (I often had to eat a peanut butter sandwich after dinner just to get through the night). My current version is, I hope, a little more carefully put together. 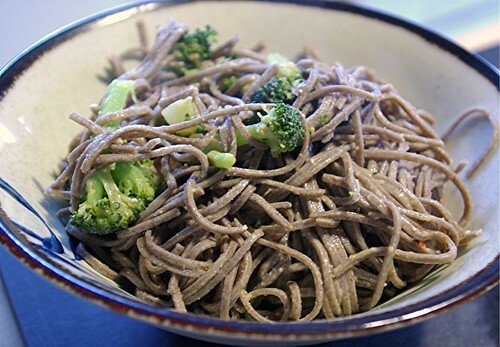 We only recently discovered how good buckwheat soba is in this dish, but I like it a lot – the creamy sauce and tofu against the earthy bite of the noodles is great. Brown rice works well, too. 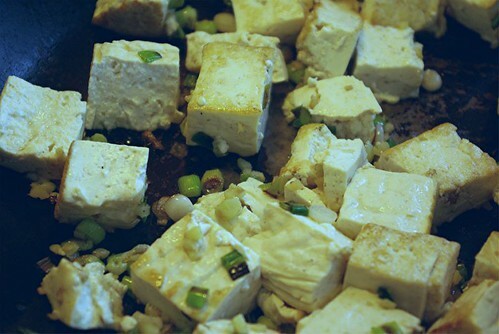 I vary how I cook the tofu – often I brush it with seasonings and bake it until it gets a little crusty and firm, but this time I seared it in a hot wok with scallions and minced ginger, which worked very well. The broccoli always gets steamed ahead of time, because I can’t deal with a bowlful of almost-raw, crunchy seared broccoli. It soaks up the sauce much better if it’s precooked. 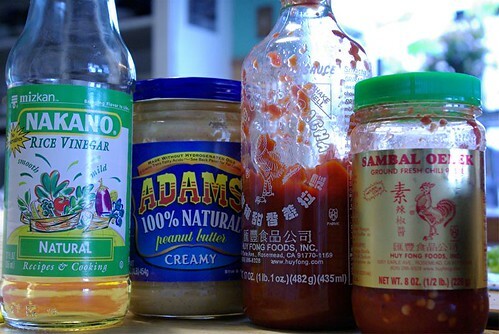 My peanut sauce is a very simplistic version – I wouldn’t use it for satay, but it works for this. It’s loosely based on a Mark Bittman recipe, and can be altered indefinitely. 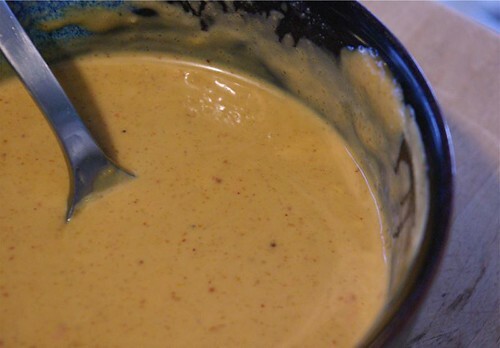 I take a big scoop of peanut butter (in our house this is usually Adams all-natural creamy salted) and dollop in maybe a quarter cup of soy sauce, then beat them together until blended and creamy. Then, mixing as I go, I add a couple glugs of rice vinegar, a drizzle of sesame oil, a pinch of brown sugar, a fair amount of hot sauce (I started with Sriracha this time, then switched to Sambal Oelek for a little more punch), then hot water to warm it up and thin it out. 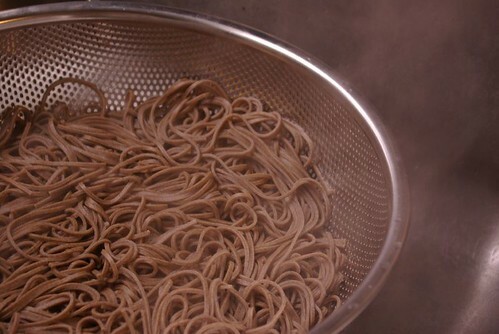 The flavor can be adjusted as much as you want, I like it to be good and spicy. Once all the parts are prepped, I just toss everything together in a big bowl and eat before it has a chance to cool down. This is a great dinner for eating in front of the television with a pot of hot tea. This dish has greatly improved from the days when it was the Moosewood Cookbook recipe as interpreted through the somewhat blurry lens of idealistic college students with more enthusiasm than actual culinary talent.